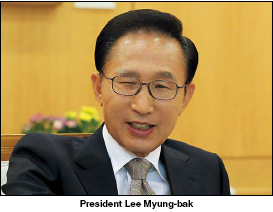 President Lee Myung-bak is set to hold summit talks with U.S. President Barack Obama and Chinese President Hu Jintao in Seoul Thursday to discuss bilateral relations and coordinate G20 agenda items including the currency exchange rates. As emerging economies such as China and Brazil criticize the latest U.S. stimulus plan to pour an additional $600 billion into its economy, Lee is expected to mediate the conflict ahead of the plenary session of the G20 summit. Having held summit meetings Wednesday with his Russian and Australian counterparts, Lee is scheduled to meet with the leaders of Britain, Germany and Brazil as well on Thursday, the first day of the two-day G20 summit. Lee is set to hold summit talks with French President Nicolas Sarkozy on Friday and Turkish Prime Minister Recep Tayyip Erdogan on Saturday in Seoul. More summit meetings are scheduled in Japan, where Lee will fly for the APEC summit over the weekend, with Chilean President Michelle Bachelet on Saturday, Japanese Prime Minister Naoto Kan on Sunday and with Peruvian President Alan Garcia back in Seoul on Monday. During the Korea-U.S. summit talks Thursday, Lee and Obama will discuss issues of bilateral alliance such as the free trade pact signed in 2007 and how to continue close cooperation on North Korea and promote trade after the U.S. midterm elections last week, Lee’s aides said. Lee’s talks with Hu on the same day will be the first since the U.N. Security Council adopted a presidential statement in July condemning the attack on the South Korean naval ship, without clarifying who attacked it. Lee and Hu are expected to confirm the continuity of the strategic partnership between their countries despite the discord over the Cheonan’s sinking and Beijing’s collaboration for the success of the G20 summit as well as peace on the Korean peninsula. 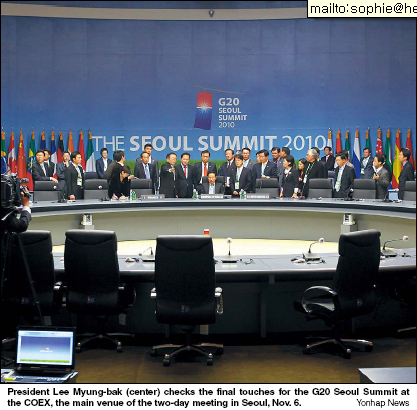 The two leaders will also discuss the start of negotiations for a Korea-China FTA, according to Lee’s aides. Lee will be meeting this week with his counterparts of all other members of the stalled six-party talks except for North Korea the U.S., China, Japan and Russia drawing attention to whether they could resume the negotiations soon. During bilateral summit talks with British Prime Minister David Cameron and German Chancellor Angela Merkel on Thursday, Lee plans to request for cooperation in ratifying the free trade deal signed last month between Korea and the European Union. Brazilian President Luiz Inacio Lula da Silva has said he was going to the Seoul G20 summit to fight the currency war between the U.S. and China. In addition to the currency battle, Lee plans to discuss economic cooperation with Lula including a highway construction deal in Brazil. During Lee’s summit talks with French President Sarkozy on Friday, the two leaders are expected to speak about the return of Korea’s ancient royal texts looted in the 19th century. Korea has been stepping up negotiations with France to retrieve the “Oegyujanggak” royal texts that French troops seized during an 1886 invasion. With Prime Minister Erdogan on Saturday, Lee will exchange views on a deal to build a nuclear power plant in Turkey. On Wednesday, Lee held talks with U.N. Secretary General Ban Ki-moon, Russian President Dmitry Medvedev and then with Australian Prime Minister Julia Gillard on bilateral issues including the ongoing negotiations for a free trade deal between Korea and Australia. Lee and Medvedev discussed bilateral economic cooperation involving the development of energy, natural resources, Siberia and Russia’s economic modernization as well as the six-nation talks aimed at denuclearizing North Korea.